PLANO, Texas--(BUSINESS WIRE)--Aug. 2, 2018-- Cinemark Holdings, Inc. (NYSE: CNK), a leader in the motion picture exhibition industry, is giving Wizarding World fans the exclusive opportunity to relive the magic through the world’s No. 1 premium label large format experience, Cinemark XD – certain to cast a spell over moviegoers through enriched color and immersive surround sound. 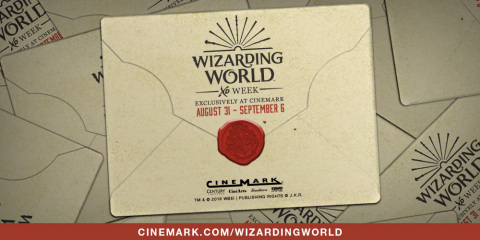 Wizarding World XD Week will take place at all 141 Cinemark XD locations from Aug. 31 through Sept. 6. Tickets go on sale Aug. 3 at Cinemark.com. Twenty years after the U.S. release of the book that started it all, Harry Potter and the Sorcerer’s Stone, fans of the franchise can experience the magic of all eight Warner Bros. Pictures movie adaptations of the beloved books as well as “Fantastic Beasts and Where to Find Them” at Cinemark XD locations around the country. Tickets to see the movies in Cinemark XD are $5 per film, or fans can purchase a limited-quantity festival pass for $25 to have access to all nine movies, all week long. The Wizarding World XD Week festival pass includes a collectible keychain, a specially designed cup that is refillable for $3.50 through the end of the year and a commemorative festival badge. For those fans who want to take home a piece of the magic, Cinemark will be offering a special Fantastic Beasts cup for purchase that is refillable before and during the opening of the next Wizarding World adventure, “Fantastic Beasts: The Crimes of Grindelwald,” on Nov. 16. Additionally, exclusive Wizarding World merchandise will be available for purchase at all participating Cinemark locations. Cinemark XD is the No. 1 private label, Premium Large Format (PLF) in the world. XD auditoriums feature expansive wall-to-wall screens, custom-engineered surround sound with multi-channel speakers and state-of-the-art projection systems. This technology is designed to transform the moviegoing experience and will sweep fans straight into the spellbinding world of Harry Potter and Fantastic Beasts. Tickets and the festival pass for Wizarding World XD Week go on sale on Aug. 3. Guests can purchase their tickets and learn more at cinemark.com/wizardingworld. For more information about Cinemark XD, visit cinemark.com/xd.